Good morning everyone and welcome to America’s Finest City and the 2018 PSCR Conference. I am so pleased to see what is happening in the world for first responders. The reality of a nationwide public safety broadband network has created a marketplace to develop solutions that will help save lives and make the work of public safety more efficient. And these solutions are focused on what has become the 5th network in the United States. Public safety now truly has its very own network with FirstNet! Sometimes we can take for granted what has been achieved, so I’d like to highlight what happened just in the last year to get us where we are today. In March 2017, we signed the contract with AT&T. I’m sure I am not the only person who vividly remembers that day. We were fortunate to have key leaders from the public safety community with us that day - clearly a historic moment in this journey. With the contract in hand the next order of business was finalizing the State Plans and getting them in the hands of the Governors. That was accomplished in record time and, in fact, plans were delivered three months ahead of schedule. With the State Plans in the hands of the State officials, we continued to consult with those who were interested and provided answers to any questions that remained. The States started opting in to FirstNet. By the end, every single State opted in – another important milestone achieved. So, all the pieces were in place to finally start deploying the long awaited nationwide public safety broadband network. With AT&T’s announcement that it was making its entire network available to public safety with priority and preemption instead of having to wait to deploy Band Class 14, FirstNet began offering service in short order. FirstNet is the first nationwide network to have offered preemption over LTE for public safety. Since this network is designed on a single, nationwide network architecture, the next key deliverable was the FirstNet core. On schedule again, the fully dedicated, redundant and physically separate core was delivered and customers are currently being migrated. Already, the dedicated FirstNet security operations center is online and operating. And dedicated FirstNet personnel are in place to provide 24/7/365 customer support. One of the concerns early on was whether there would be a choice of devices. Already there are 20 devices in the marketplace— Sonim, LG, Samsung are some of the most recently announced devices for FirstNet. Our partner has also hit the ground to deploy Band Class 14 – public safety’s spectrum and important capacity for the unfortunate disasters that continue to occur across our nation. And throughout this process, the First Responder Network Authority continued engagement with local, state, federal and tribal organizations to answer questions and provide support. I think it’s encouraging and impressive to see what has been accomplished and is ongoing to provide public safety the capability they’ve wanted for decades. What is interesting is that there seems to be some confusion in the market about exactly what FirstNet provides and why it’s very different from others. FirstNet is a network fought for, designed by, and built for Public Safety. FirstNet is what Congress mandated—a single, nationwide network architecture. FirstNet is a network built specifically to the specifications that first responders and individual states established through a multi-year state consultation and RFP process. FirstNet has a separate, redundant and dedicated core – it is NOT a virtual core as part of a commercial network. FirstNet provides an Applications Catalog that ensures that applications are tested and certified. FirstNet provides dedicated security monitoring of the network 24/7/365. FirstNet has dedicated customers support personnel 24/7/365. FirstNet has public safety dedicated disaster recovery resources and response coordination. FirstNet has a dedicated lab run by the FirstNet Authority that tests and validates the performance of the network, devices and the applications ecosystem. FirstNet has a sustainable financial model that guarantees reinvestment in public safety’s network. FirstNet is the only network with Band Class 14. 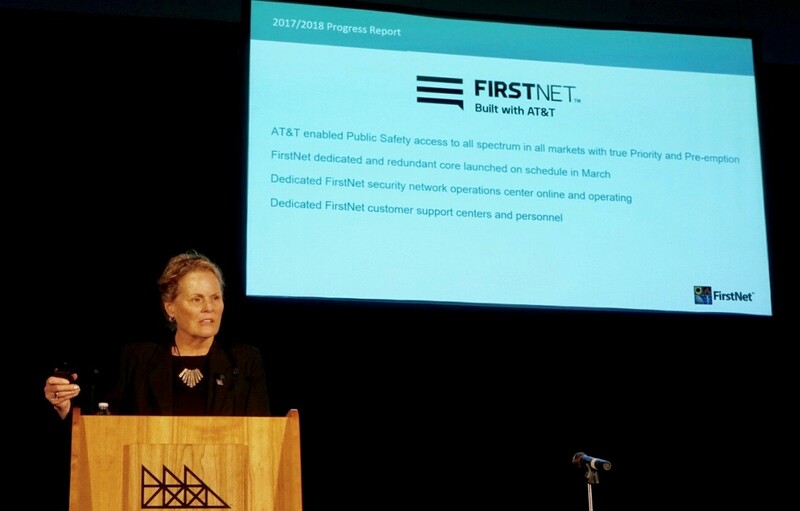 FirstNet has an oversight organization in the FirstNet Authority that not only ensures that AT&T delivers on its commitments but also advocates for public safety. I hope that clears things up a bit because FirstNet is the only network that is delivering to public safety everything that they wanted in their network. And while we should all be thrilled that we are where we are today, I think you should know that our work is not done yet! It’s easy to become complacent when things are going well. It happens to championship sports teams and successful companies. You have to work extra hard to stay on top and continue to make progress. We have built the equivalent of an “autobahn” for public safety. Now it’s time to build the “cars” that will drive on that information super highway. But I think we’ve arrived at a point not dissimilar to where we were in 2007. While there are several organizations advocating for public safety, I believe that public safety needs to drive what now gets developed – not only for the individual public safety disciplines, but across public safety as well. FirstNet has created an exciting marketplace, but that marketplace needs focus and prioritization. Public Safety needs to drive that. It’s hard to believe that I have been on the FirstNet Board for almost 6 years. They say time flies when you’re having fun. I can’t say that it’s all been fun, but it has been incredibly rewarding to be involved in something that not many thought could be achieved and makes such a difference to our country. My term as FirstNet Board Chair is up this year and the Secretary of Commerce will determine who succeeds me. I want to thank the current FirstNet management team and Board as well as the previous members of the management team and Board for their support during my tenure. I also want to thank AT&T for delivering to public safety what they fought for, designed and are now implementing. Without the commitment you’ve made to public safety this never would have been possible. Most of all, thank you to public safety – not only for what you do every day but also for never giving up. FirstNet is your network. It’s here today because of you. Together, we accomplished what we set out to do back in 2012. Six years later, we are now ready to write the next chapters of the FirstNet story. Many of you in this audience will be responsible for making sure those next chapters are as exciting as the first one.